Four people died in a horrific accident one summer Saturday near Vernal Utah. When I was ten years old my family and I were returning home from a camp out. as we traveled through the canyon that connects Vernal Utah to the Flaming George recreational area we started to see very thick black smoke rising from the area we called the switchbacks. The switchbacks were famous for their accidents, but they were also near a mine so my family and I expected that the smoke was just from a recent blast. We were wrong. A semi had lost control, left the road, traveled across an entire switch back and had landed on top of another semi. All occupants of both Semis were killed immediately, including a child riding in the truck with their father. We were one of the first cars to arrive. I still remember the smoke and the sound and the horror in everyone's eyes as they tried to take in all that happened. As we sat there the semis burned intensely, we had to move our cars back because of the risk of exploding gas tanks. From that day on, i have taken the task of driving in a canyon very seriously. Living in Brigham City has brought this lesson back repeatedly. Throughout my career as an educator here I have had many students who have had very personal experiences. A Survey of students of Box Elder High school shows that 67% of students have been directly impacted by an accident in the canyon. 23% have had family members in accidents, and 11% have been in an accident themselves. Wreck Kills one, two teens injuredA multi-car accident on the Cache County side of Sardine Canyon killed a 51-year-old Wellsville man just after 5 p.m., while an accident on Redwood Road an hour later in Taylorsville took the life of another man. Three people were hospitalized in critical condition from the two accidents. Accident in Sardine Canyon Kills ThreeLOGAN, Utah (AP) -- A 12-day-old baby boy and his mother were among three killed in northern Utah's Sardine Canyon when two cars and a bicycle collided. The accident happened just after 4:30 p.m. Friday on U.S. Highway 89/91 near the Cache and Box Elder county lines, said Utah Highway Patrol Sgt. Blaine Robbins. Those killed include 12-day-old Norrison Deschner, his mother, 38-year-old Trudy Middleton and 37-year-old bicyclist Robert Bennett. Man Dies after roll over in Sardine Canyon WELLSVILLE, Cache County — An Orem man was killed after being ejected from his vehicle in a single-car accident in Sardine Canyon Saturday morning. 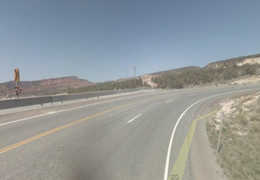 Rogelio Gallegos, 38, died just after 10 a.m. while driving on state Route 89/91 just north of Wellsville, according to the Utah Highway Patrol .UHP Sgt. Ted Tingey said Gallegos was traveling too fast, and his car started to drift toward the center barrier. The car then swerved across the roadway and went off the shoulder and down and embankment, rolling several times, Tingey said. Gallegos was ejected and the car ended up at the bottom of the embankment, he said. "The driver was not wearing a seat belt, and alcohol was a factor in the crash," Tingey said. Witnesses told police they saw the vehicle driving recklessly several miles prior to the crash, but no one called to report it, Tingey said. Law enforcement officials need help from the public when they witness such driving, he said. "If we all work together, we can save several lives and make a difference, especially on a holiday weekend," Tingey said.